1. There are times when we do not have time to get out messy materials which we have to clean and pack up. 2. There are times when we do not have the space to spread out art materials for a whole class. 3. If we can do more art, because the iPad affords us more time i.e. less mess and setting /packing up then all the better for our students. 4. Students can use the iPads to plan out a piece of artwork that can then be done with traditional materials. 5. 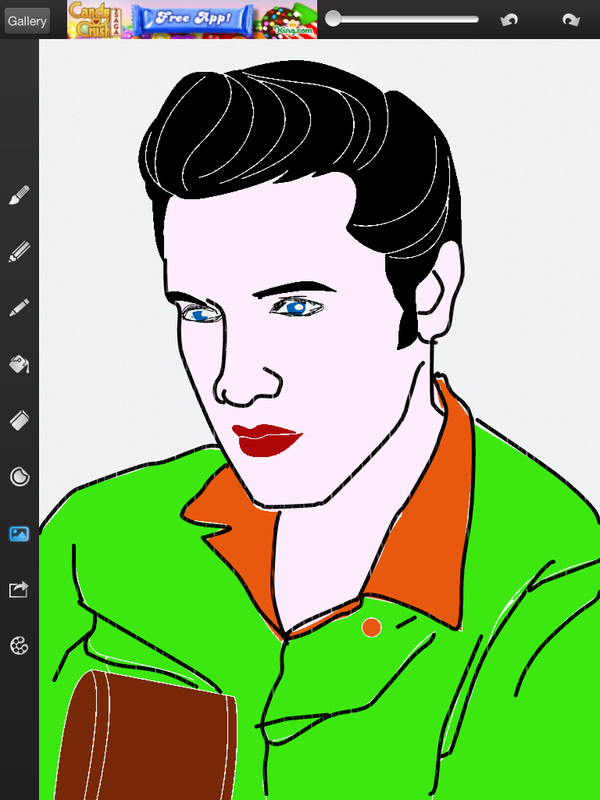 Use apps that are instructional (like ‘How to Draw’). Sit the iPad alongside the pencil and paper and use video to help students learn drawing techniques. A final recommendation would be that while all art works in these apps can be produced with fingers controlling the brush, pencil etc it is much more effective to use a stylus allowing for a more traditional feel of having a brush or pencil in the hand. This is a great free app. You can upgrade the app for $2.99 which allows you to produce layers allowing for more control and detailed art work. I have used this app without the layers function and found it excellent. The app allows for colour selection, undo, redo, erase, adjust brush width as well as a huge range of brush techniques that can all be individually adjusted. Adjustments that can be made to the type of brush stroke include density and intensity among others. The art work can be enlarged so that fine details can be painted. Another great feature once an art work is completed is being able to play back a video of the art work as it was created step by step. Below is a painting that I created using the free version of brushes while below that is a video demonstrating how the app plays back the step by step creation of a painting. This app also allows students to create detailed art works. 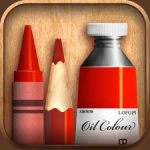 Unlike brushes which is purely a painting app Art Set has a range of mediums including crayon, oil paints, coloured pencil, oil pastel and texta. Art Set also allows the artist to enlarge the image to create detailed drawings. There are some limitations to this app which include only a certain number of undos and brush strokes are limited to one size. 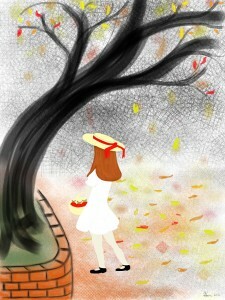 This is more of a fun app than a serious drawing app like Brushes or Art Set. It has a large number of backgrounds including holiday themes, famous people, colour selections, styles plus you can add your own photos. Backgrounds can be coloured and drawn over and then removed leaving the drawing and colouring done by the student. Students can also draw freely in the app using a brush, pencil or crayon. The app allows for the widths of these to be adjusted and there is a rubber function. Students can also apply stickers to their art works from the 40 available within the app. The image below is of the ‘Elvis’ background which I painted using the Fill (bucket) function. 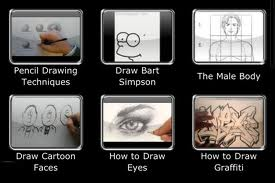 How to Draw is a free app that has a collection of You Tube videos in it teaching students how to draw using pencil. Videos cover shading techniques, cartoon faces, eyes, perspective, faces and more. If this app cost money I would not recommend it but as it is free it is a starting point for using video to assist students to draw. There are a huge range of how to draw videos on You tube and there is nothing to stop you from getting students to find their own how to videos. The ones in this app are just a small selection. 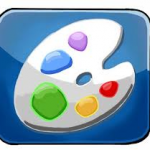 This site provides information about visual elements and principles of art. Information is provided about line, colour, space, shape, balance, movement & rhythm. There are also two videos which show professional artists creating original art works using the principles covered in the toolkit section of the site. The site also provides an Encyclopedia which is an in-depth guide to learning more about the building blocks of composition. Here you’ll see many examples of works of art that illustrate the visual elements and principles. Looks like an easy to use and informative site for helping to teach students about art. Don’t forget to visit the Curriculum page on this site for web resources associated with subject areas including the Arts Connected Toolkit.